Bread is often cited as a cause of obesity. But the facts just don’t stack up. 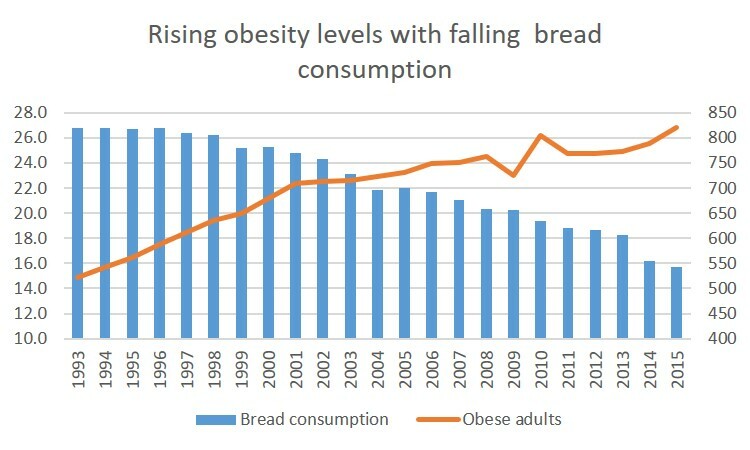 Bread consumption in the UK has been in steady decline since the 1990s, while obesity rates have soared. How can bread be to blame? The evidence suggests that it’s the lack of bread that is correlated to expanding waistline. The chart below shows this is practice; and takes bread consumption data from The Food Family Survey, 2016; and obesity data from the Health Survey for England, 2015. Can we really lay all the blame with bread? In reality it contains just 80 calories a slice; is a major provider of many vitamins and minerals essential for good health, including calcium, iron and folate. So bread should in fact be heralded as a health food rather than a junk food.